Last night the fine folks at ASIFA HOLLYWOOD hosted a free screening of Pixar's UP which included a sooper triple special bonus Q and A session with the film's director Pete Docter! It was a bit late notice... but I dropped everything and ran over to the famous Mann's Chinese Theater in Hollywood and grabbed myself a seat. I loved it even MORE the second time! 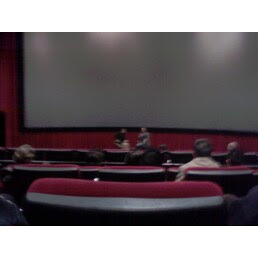 Sorry... this was the best picture I could get with the lousy camera on my phone. • The story was originally even farther 'out there' and was more of a "Muppety Ernie and Bert in some kind of cloud kingdom" story until they started paring it down to find the "emotional core" of the story-- which ended up being 'about how Carl feels like he screwed up by never taking his wife on an adventure to Paradise Falls, but eventually realizes that their relationship was the adventure all along". • When asked why they set the adventure in South America, Mr. Doctor said that Carl and Ellie's original destination was a deserted island, but they thought that location had been 'done' to death. Eventually Ralph Eggleston showed them a documentary about the rocky South American jungle that made Mr. Docter feel like that particular landscape WAS Carl himself-- craggy, stuck in time, desolate, etc. "The setting became the character and vice versa". • On the topic of the film's pitch perfect voice acting, he said they spent a LOT of time auditioning... and that most professional voice actors were a bit forced ("too much jazz hands"). So they opted towards non-professionals, like the kid who played Russell. But because he WASN'T a professional, they "paid the price" and had a really hard time getting him to where they needed him. In a lot of cases they resorted to a kind of "method acting-- where I would hold him upside down or crush his arms at his sides to get the sound of him struggling-- whatever the scene called for". • Also, it was Mr. Docter's daughter who played the young Ellie at the beginning of the movie. They originally recorded her as scratch track but everyone loved her reads so much it stayed in. 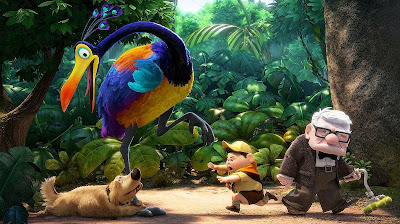 Ed Asner (the voice of Carl) claimed she was "the best thing in the damn movie". * One audience member claimed that Ellie's heart wrenching death made UP "the BAMBI of out generation". • Another asked how Mr. Docter knows when he's 'got' a story right. His answer was: "When the deadline is up and people stop giving notes". • In regard to the use (or misuse) of 3-D in films, his rule was that it had to be "...a movie about Carl Fredrickson in 3-D and not a 3-D movie about Carl Fredrickson." Which means that if the 3-D effects were too in your face (or in his words "Too Booooga Booooga!") then you're taking people out of the story. 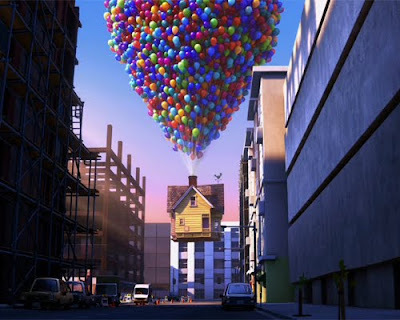 • One of the few sequences to remain virtually untouched from storyboard was when the house took off and flew through the city. It was pretty much shot for shot the way the board artist envisioned it. The opposite was true for the sequence when they first met Charles Muntz, which they couldn't quite get right for a long time. • A great question that came up was about particular production problems which led to breakthroughs. MONSTERS, INC had serious issues with animating fur in CG. Violet's hair in THE INCREDIBLES gave the programmers fits. The water in NEMO. So were there any big issues, as well as breakthroughs, in UP? The answer? Caricature. The character proportions made things tricky (ex. Carl can't touch the top of his head from a standing position) and they wanted simplified wrinkles for the clothing to achieve a certain look (they studied a lot of Hank Ketcham for reference). Instead of trying to be a realistic as possible (like MOST CG productions try to do... to yucky effect) they wanted to make a stylized world which ended up requiring a lot of 'cheating' to make things work. • There was a lot of talk about the use of color in storytelling as well, which is always fascinating (I went to a lecture in NYC with Ralph Eggleston and others about this and it never gets old). He brought up an example of the world being bright and vibrant when Ellie was around, but dim and monochromatic after she passed away, only to brighten again once Russell showed up. Gotta love those Pixar guys. I wish ya'll could have been there because there was lots more, and all of it was said way more eloquently than I've transcribed it. Anyway, thanks for the night out, ASIFA HOLLYWOOD. Can't wait to see whatcha got next! Well, now that I'm finally feeling a bit settled here in LA, it's time to get out and start blathering again! 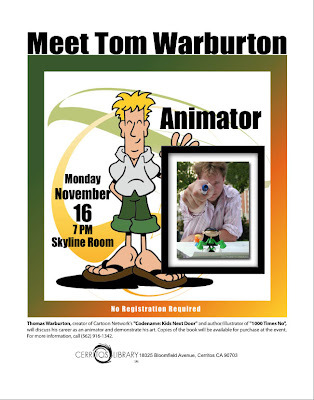 Yup... this November 16th, I'm hoping you'll head over to the Cerritos Public Library over in Los Angeles, CA... Because that's where I'll be reading 1000 TIMES NO, talking about animation, and maybe even showing some other books that are in the works! That's right... KND operative Alejandra 'Male' Cuellar, leader of Sector ES (El Salvador) and member of the KND's Elite Ninja Graphic Design Squad has added even MORE win to her ever expanding portfolio. 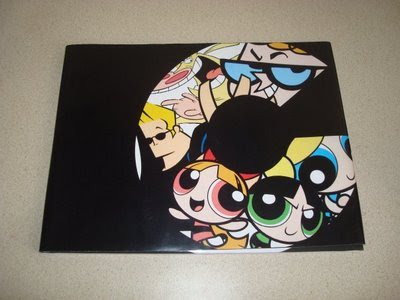 Perhaps you remember the Cartoon Network coffee table book she designed for one of her classes? Rockin' right? Alejandra's assignment was to design packaging for a favorite toy, and she chose a Numbuh Three figure she had picked up at McDonalds a while back. If I was handing out the grades, this would definitely be a quadruple A++++++++ squared with extra special bonus confetti thrown in the air. "All right, Noah, dear. It's time to leave," a mom tells her toddler, who responds with "No"--in many fonts, employing many synonyms, and in many different foreign (and other, like robot) languages. The book, featuring cartoony art and a funny resolution, calls to mind Mo Willems's Pigeon series, from its single-minded protagonist to the punch lines found in facial expressions. hornin' in on MY book review AGAIN! This book definitely does celebrate every toddler's favorite word - no! 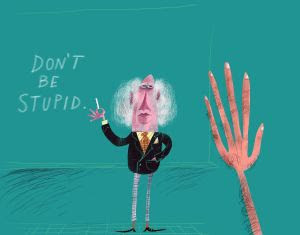 And a lot of times, when we hear this word, we think of misbehaving children... and sometimes, that just means (or leads to) a grouch... making it an appropriate book to share for National Grouch Day. However, I could see this book as a valuable teaching tool to introduce children to languages other than their own! Definitely a great book to have on the shelves! The baby is this book is just like any other baby. Sometimes, he just does not want to do things. And he is not afraid to say so. In fact, he says no in about a million different ways and languages. This book is very entertaining and informative (For example, Ugui means no in Mongolian) and the illustrations are cute and clean. I loved it. 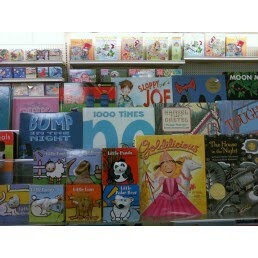 A couple of titles which the kids will think are fantastically funny, but parents may be a little more reticent about reading to them are When Mommy was Little (Valerie Larrondo) and 1000 Times No (as told by Mr. Warburton). The titles give them away, just as the books themselves may give your children ideas (such as you not being the angel you want them to believe). But they are great fun nonetheless. Thanks to everyone for the awesome reviews! I've always loved Dan Krall's work but had only talked to him in fleeting bursts whilst meandering the halls of Cartoon Network Studios over the years. Although recently, via that handy Facebook thingie, we ended up chatting and promised to get together once I made the big move out to LA. 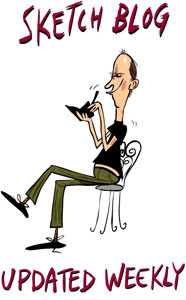 If you're not familiar with the guy, I'll wait here while you go check out his sketch blog. It's right over HERE. Yeah... you've seen his background art as well as his character and production design on almost every show coming out of Cartoon Network Studios-- Dexter, Powerpuff Girls, Samurai Jack, Fosters, Gym Partner, Chowder, etc etc etc. 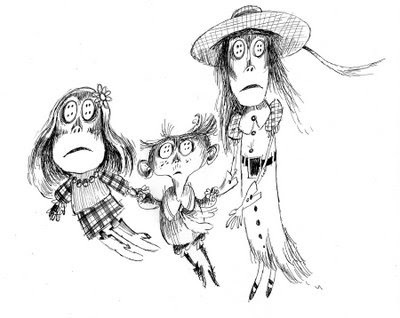 He was also primarily responsible for the early character design in the movie Coraline... something he and a lot of the other artists got NO credit for in the 'Art of' book. And of course it's beayooootiful. 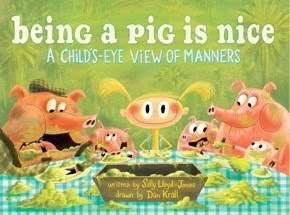 Go grab a copy of BEING A PIG IS NICE right now and see for yourself. 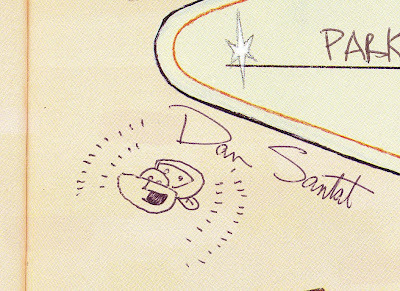 And you're not going to believe this... but I TOTALLY forgot to ask Dan to draw something in my sketchbook! 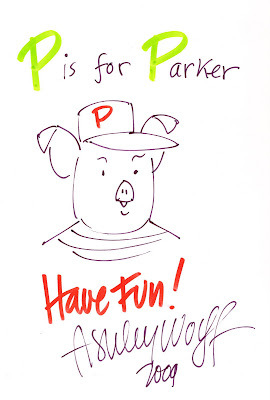 I even forgot to insist he doodle something in the copy of his book he signed for me! But don't worry, I'll get him next time! Thought I'd give you guys a free scoop of Mr. Fontenot's latest pencilization of an upcoming Cartoon Network Action Pack story! 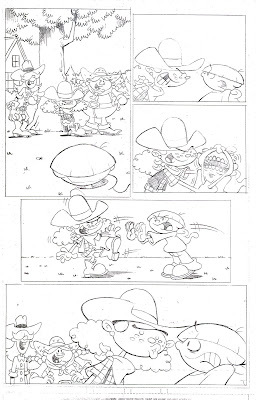 And why do I get the feelin' that Numbuh Four ain't gonna like what these cowgirls got in mind for him? So the fabulous Mrs. Warburton is back in the old country (NYC) for some work and I've got the vikings for the weekend. So what am I to do with them? 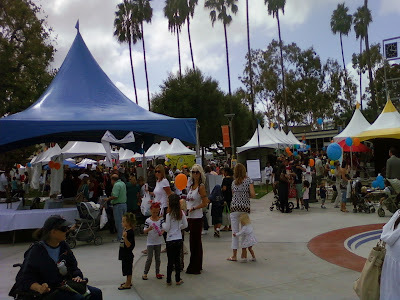 How about taking them to the Orange County Childrens Book Festival? Being new to the area, I had no idea this was even going on! But fortunately, sooper recent sooper pal Dan Santat mentioned on Facebook that he was gonna be there. So I looked into it, saw a lot of stuff for the kids to do, and decided to make the drive down to Orange County. Right there at the entrance was a Thomas the Tank Engine train table along with a whole bunch of antique train set-ups. Now if you have kids, especially boys, you know that this will keep the kids busy for a LOAD of time. The maniacs loved it so much, (especially the free blank boxcar they were giving out to color) that I thought we'd never get past the entrance. Then we heard about the free bouncy castle. And the free kiddie train ride around Orange Coast College. Dude... this books festival RULED. He was sooper triple busy sellin' and signin' his wares-- books, prints, etc etc. And I traded him a copy of NO for his GUILD OF GENIUSES... which rocks pretty hard. He also insisted we give her a copy of NO, which he insisted on signing as well! All in all, a rockin' time in Orange County, CA. 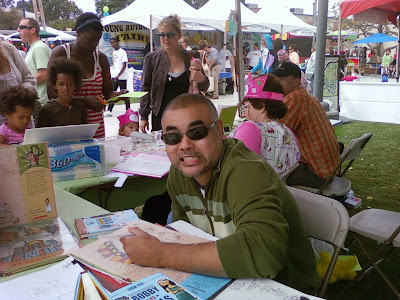 Hopefully next year I'll be there to do a reading and sign some books! We all get a PILE of magazines. You've got your People, your New Yorker, your Cat Fancy. Perhaps you can't wait to get your latest issue of Giant Robot or Conde Nast Traveler. But I think we ALL get excited when we find the latest issue of The Tower in our mailboxes. You don't get The Tower? Well, we can't ALL be alumni of Kutztown University, I guess. So for those of you who don't get it, here's a very nice little blurb about your truly they were kind enough to print. 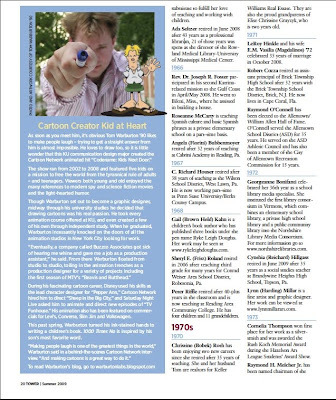 And just in case your craving more Kutztown Alumni action, you can check out the rest of the issue HERE.